Booked for cattle slaughter, Jharkhand trio wonder in hospital: Ox was already dead, how did we kill it again? Three days after they were beaten up by a mob near Jhurmu village in Jharkhand’s Gumla district over suspicion of slaughtering a cattle, the three may be safe, surrounded by family members and guarded by plainclothed policemen at the surgical ward of Ranchi’s Rajendra Institute of Medical Sciences, but the horrors of the encounter do not let them sleep. 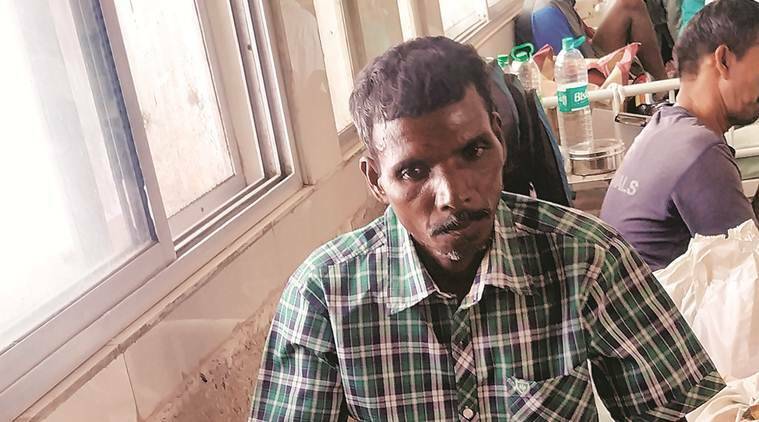 “Maaro saalon ko (beat them)’ is all we had heard when a mob of more than 25 ran up to us, armed with swords, sickle, iron rods,” recalled Janriush Minz, 40, at the hospital. Around him, in other beds, lay Peter Phuljans (50) and Belasus Tirkey (60). The fourth person with them that day — Prakash Lakra — had succumbed to the assault. The police had taken the four — all tribal Christians — to the Community Health Centre in the district’s Dumri block. Lakra was declared dead on arrival. On Friday, two of the seven men charged with Lakra’s murder were arrested. All three hope that normalcy returns back in their village, but for them it is a double whammy: the police have also booked them under The Jharkhand Bovine Animal Prohibition of Slaughter Act. “The ox was already dead, how did we kill it again,” they asked. Sitting on the hospital bed, unable to move, Minz recounted, “The four of us were caught by the mob…they shouted slogans such as ‘Bajrang Bali Ki Jai’, ‘Jai Shri Ram’. One of them attacked me with his sword; I held it midway.” Minz then pointed at a sharp cut in his palm. He said he left the sword, fearing a backlash from the mob. On another bed, with most injuries, Peter Phuljans lay with his eyes open. “The mob beat us for two hours — until we reached Jairagi village, about 1 km away (from the spot where the assault had begun). When we were unable to move any longer, they shoved us and we were forced to walk. Then they beat us again; and the same cycle repeated. Phuljans said he could not fathom what changed the mentality of the villagers, who had lived peacefully with them for generations. On Wednesday night, Phuljans said, all four of them lay motionless at Jairagi village chowk when the perpetrators called a vehicle and pushed them inside. Around 15 km away, at Dumri block Chowk, all four were dumped outside the police station. He believes it was this kindness which saved their lives. In the entry records of CHC Dumri, they had arrived at 4.30 am on Thursday. Dr Roshan Khalkho at the health centre said that he was woken up by the police around 4.15 am. “Multiple abrasions, lacerated wounds, and bruises were found on their body,” he said about the injuries. Minz recalled that while he lay in the CHC, he had nudged Prakash Lakra’s body. The doctor then informed him that he was no more.